Although the word rodon is not used in everyday conversations, the word is still alive and it is used in poetry or song lyrics, titles of books etc. In Modern Greek, the word triantafyllo is mostly used and describes a specific “thirty-petal” cultivar grown for rose oil. That name has spread to Bulgarian as trendafil [трендафил] (slightly archaic) and to Albanian as trëndafil. Another explanation is that because there were a lot of roses on the island, the rose was the emblem of God Helius (sun), who was worshiped on the island. The famous Colossus of Rhodos which was one of the seven wonders in the ancient world, a huge statue 30 metres high, was dedicated to God Helius. Triantafyllo (rose cordial) is a syrup produced in Cyprus which is mainly used as a sweetner on desserts, such as Mahalebi or to flavour ice cream. We used to love it when we were kids and adding it to cold milk was better than milkshake. Whenever I go to Cyprus I make sure to bring a bottle with me and I remember when we were kids and hated drinking several medicines, my mother would always give us some triantafyllo after so that the bitter taste of the medicine would disappear and I did the same thing when my kids were younger. The drink is also called Triantafyllo and there is no recipe for this drink. The amount of Triantafyllo depends on how sweet you like your drink. You can also drink Triantafyllo with only cold icy water and it is also a lovely thirst quencher, just like lemonade or orangade. This is my participation to FIC – Pink/Rose, the brainchild of Harini, of Tongue Ticklers, and hosted by Priya, of Priya’s Easy N Tasty Recipes. Wonderful! This cordial must taste heavenly! Wow I would like to try it !! This looks lovely Ivy! And what a great write up on the history of the rose…better than school! Wish i would have a sip of that delicious drink. Here i saw oncerose syrup from monin, i think i should buy that to make this drink. It might not be tasty as the syrup i see in your pic. Wow thats a delicious drink Ivy..lookz amazing..Thanks for sending to FIC!! Looks refreshing Ivy! Lovely color and thank you for all the info! Wonderful background piece on roses. That drink mixed with the milk looks tasty! This looks gorgeous Ivy – those photos are lovely. Sounds amazing and looks elegant. Thanks for the great info on rose cordial. My Lebanese grandmother used to make us a drink when we were young which was similar, but using ingredients that could be found in a Canadian market at that time. 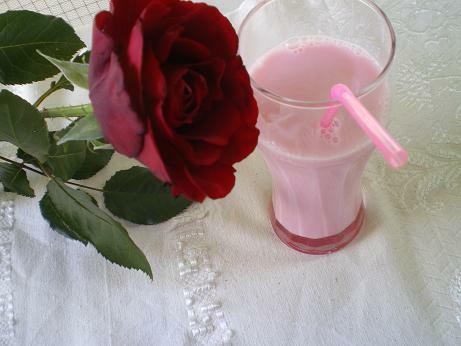 She would thin yoghurt with water and add grenadine and rose water. Holy moses was it delicious…but I think I liked it more because it was pink! This is delicious however I am wondering if there is any caffeine in the syrup. After having some (and I don’t have any more than a couple of cups of tea a day) was a sleepless night. Very unusual. This is how I came across this blog as I am researching if there is any caffeine in triantafyllo. I would appreciate any feedback. Than you.